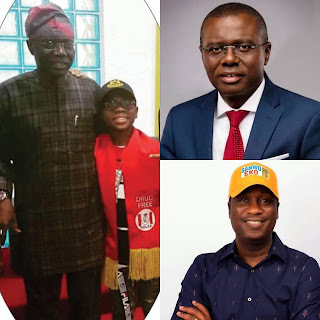 Home Entertainment Politics LAGOS GUBER 2019: OzzyBosco Smile Foundation Endorses Babajide Sanwo-Olu, Says He Is The Only Candidate With The Future Of The Nigerian Child At Heart. LAGOS GUBER 2019: OzzyBosco Smile Foundation Endorses Babajide Sanwo-Olu, Says He Is The Only Candidate With The Future Of The Nigerian Child At Heart. In less than 48hrs from now, Lagosians would be cueing up again in Lagos to exercise their franchise to elect those who would represent them at the State Assembly and the next Governor of Lagos, a keenly contesting position, which is bigger than some presidents in some African Countries we know. And to make her impact felt in the electioneering process in the state, a Lagos based Charity Non Governmental Organization, NGO, OzzyBosco Smile Foundation, has thrown her weight behind the governorship candidate of the All Progressives Congress, APC in the Saturdays election, Rt. Hon. Babajide Sanwo-Olu. The NGO which powers the African Best Kid Entertainer and NDLEA youngest Celebrity Ambassador, OzzyBee a.k.a OzzyBosco WonderKid, believes that Sanwo-Olu has a great love for the African Child and so will provide an enabling environment for Nigerian Children to find their feet when voted into office as the Governor of Lagos State. Speaking through the President of the Foundation; Chief Elizabeth Mojekwu, the foundation urges Lagosians to come out enmas on Saturday, the 9th of March and vote for the Governorship candidate of the APC and other candidates of the party to ensure continued progress in the development of Lagos which started far back from 1999 when Asiwaju Bola Ahmed Tinubu was Governor. It is our desire at OzzyBosco Smile Foundation, Chief Mojekwu says, to see a Lagos where every child is given equal opportunity to excel in their God given talents and areas of strength, as our major talent, Ozzybosco has excelled through dent of hard-work and consistency, coupled with the kind of opportunity provided by Lagos, the Nigerian home of diverse opportunities, which is why we are supporting the candidacy of Sanwo-Olu for the continuation of the abundance of opportunities for all children and everyone living in Lagos. Babajide Sanwo-Olu is the choice of OSF in Lagos, and we encourage all and sundry to ensure this comes to fruition through the casting of our votes on Saturday.